Looking for an affordable and efficient way to get high quality, premium diapers and wipes delivered straight to your home each month without having to make any stops at the grocery store? If so then a diaper subscription box is the perfect option! Whether if you’re looking for diapers, wipes, or any other essentially baby products, these diaper subscriptions are exactly what you’re looking for! Just choose your size and frequency and that’s it! 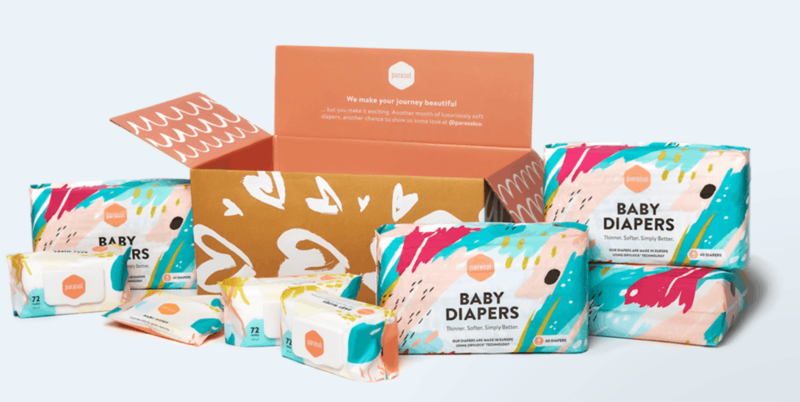 Here are the best diaper subscription boxes that any mom, dad, or person in that family that has a baby needs to subscribe to this month especially if they want to save money this month. Plus, these also make great gifts for new parents! What it costs: $70 – $80 a month. What’s inside: With Parasol, you’ll get a monthly box of disposable, ultra-soft diapers for babies. Best of all, these diapers are baby-safe and made from eco-conscious materials that aren’t rough and bulky. To get started, just choose if you want diapers and wipes or just diapers, thee choose how often you want them delivered (3, 4, 5, or 6 weeks). Coupon / Buy Now: Get yours HERE. What it costs: $59.95 for the first month. What’s inside: Each month, you’ll receive 6 packs of soft and super absorbent diapers, as well as 4 packs of durable, plant-based wipes. Plus get free shipping! What it costs: $80-$100 a delivery plus free shipping. What’s inside: With the Made Of diaper subscription, you’ll receive 10 hr absorbency diapers along with soothing organic baby wipes in every delivery. Plus, there’s even a deluxe subscription that also includes diaper rash cream and calming organic baby powder. Coupon / Buy Now: Try it risk free HERE. What it costs: Varies depending on diaper brand and quantity. What’s inside: When you join Amazon Family, you’ll receive a box of name-brand diapers delivered straight to your door as often as you’d like. Best of all, you get to choose form popular diaper brands like Pampers, HUGGIES, Luvs, GoodNites, and Pull Ups, just to name a few. Coupon / Buy Now: Save 20% on diaper subscriptions when you join HERE. What it costs: $69.99 a month. What’s inside: Each month, you’ll revise a box of premium diaper and wipes that were responsibly manufactured in Europe with no chlorine, inks, heavy metals, taxes, allergens, or fragrances. Best of all, these ultra thin and extra absorbent diapers and very skin-friendly. Plus with each subscription, My Diaper Box donates a box of 40 diapers to a child in need, which is amazing. Coupon / Buy Now: Buy HERE. What it costs: $17.95 – $109.95 a month. What’s inside: Each month, you’ll receive a new, cotton, stretchy, reusable, and cute pocket diaper each month. Plus, some monthly plans even include new product samples perfect for your child. Thanks for reading and hopefully you find the best diaper subscription box that fit yours and your kid’s needs.